Well established in the South East of England, where they hail from, the band is highly sought after, and performs all over the UK, providing high quality entertainment for a variety of events, such as weddings, parties, and corporate events. They are an energetic, experienced (and of course good looking! 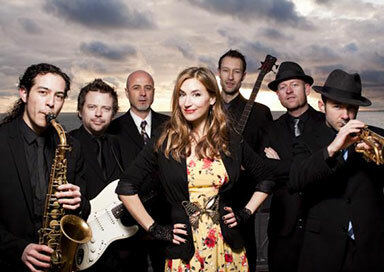 ), seven piece soul/funk band of hugely talented professional musicians. Between them, they have played and recorded with an impressive list of artists including Jools Holland, Amy Winehouse, Will Young, Roy Ayers, Alexander O'Neal, Alice Russell, De La Soul, Nitin Sawney, Viola Wills, Turin Brakes, The Freemasons and Quantic Soul Orchestra, to mention just a few! This band will keep you and your guests spellbound and dancing all night and "one more' will never be enough! Repertoire is constantly being updated and requests for events can be played, (for example first dance) if asked for in advance.